Discover how to combine Sales Navigator’s selling tools with Salesforce CRM integration, allowing tracking of LinkedIn information alongside other sales activity. For a sales professional, we know a few extra minutes here and there make a difference. In addition, clunky efforts to manage prospect information can strip you of valuable time better spent on making connections and prospect engagement. CRM integration can save up to thirty minutes of time each day, according to an Accenture study. The same study notes that effective use of CRM sales intelligence increases sales productivity by 17% per rep.
Today, LinkedIn and Salesforce offer upgraded Account and Contact Profiles, which allow you to view LinkedIn information and insights within Salesforce. Now, you can track LinkedIn-specific information alongside other sales activity, all within the same application. Combined with the powerful tools in the new Sales Navigator, you can stay focused, informed, and trusted throughout the buying cycle. 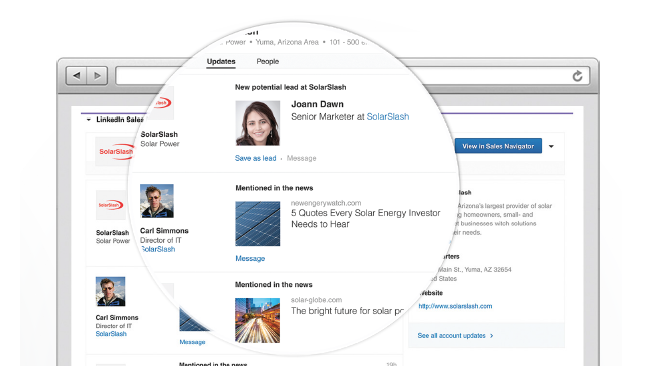 LinkedIn’s latest updates integrate new Sales Navigator features within the existing Salesforce experience. You no longer need to leave Salesforce to leverage the insights from LinkedIn, and you can also perform key LinkedIn activities from within the application. Connect, messages and InMail directly from Salesforce: The upgraded Account Profiles display the latest Lead and Account Updates including news mentions, shares, job changes, and more. You can respond to updates by sending InMails, creating customized Connection Requests, and saving new leads from within Salesforce. Discover lead recommendations: Find new leads directly in Salesforce, delivered from the preferences set within Sales Navigator. 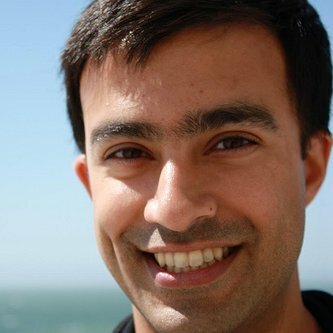 When you view Account Profiles within Salesforce, you will see similar decision-makers and influencers at the same company. 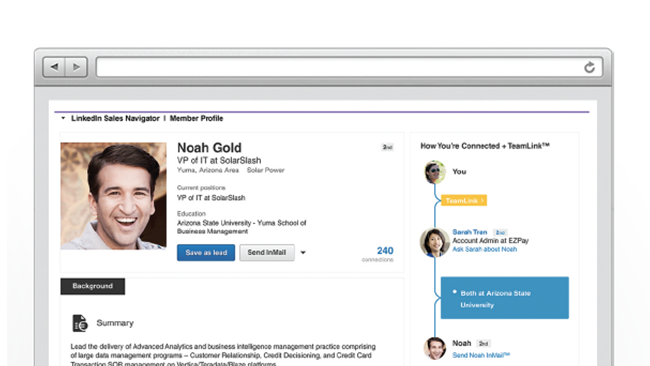 View prospect profiles and uncover team connections: View a prospect’s Profile inside Salesforce, and TeamLink displays any existing connections within your sales team next to the profile. This helps you establish warm connections through your team members. Access important company information: Salesforce displays a company’s description, headquarters address, website, and contact information directly from its LinkedIn Company Page. 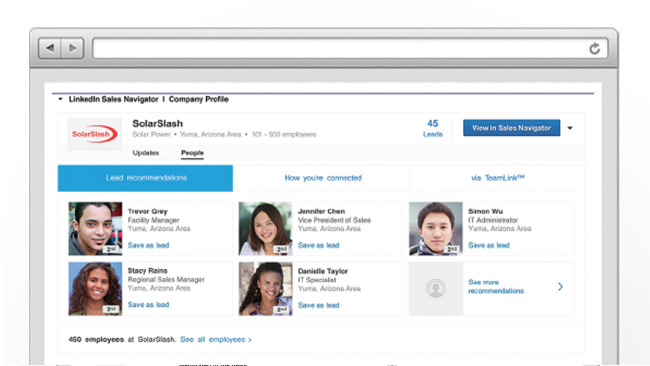 With the new LinkedIn/Salesforce connection, you can immediately connect with leads met at conferences, tap co-workers for warm introductions, send messages, and capitalize on breaking lead opportunities. Learn more about the Sales Navigator product, and contact us for a free demo.